Stepping off the bus after paying her toll, Rosa headed towards the rear entrance to get back on. She waited her turn to board the door for colored riders before finding a seat at the front of the "colored section". Her back and fingers ached from sewing for hours. It had been a long day and Rosa was ready to get home. Little did she know her day had just begun. Rosa eyed the bus driver in his mirror as he drove the route she knew by heart. Even closing her eyes, she knew every stop and every turn. Rosa wondered if he recognized her as the woman he physically threw off the bus 12 years ago for refusing to get off after paying just to re-enter from the back. She opened her eyes to notice the "white section" had filled. Her muscles tensed knowing what would happen if another white entered the bus. It did not take long until Rosa's fear became reality. The bus driver promptly told the blacks in their first row to give up their seats. Rosa had been fighting for months the rule that the "white section" can move at whim while blacks are forced to stand on the bus even if no whites are riding. At first, none of Rosa's seat-mates moved. That was until the bus driver started heading back. The other three riders then quietly slid out of their seats but Rosa stayed firm. "I'm tired and I've had enough," thought Rosa, but she was not referring to her physical state. She sat there, staring straight ahead. "Move," demanded the bus driver. "Not today," thought Rosa. When Rosa got up that brisk December 1st morning, she had not planned on changing the country. She, like other Southern blacks, just wanted to be treated with a little dignity. Now Rosa had to make a decision. Was she going to continue to allow these unconstitutional laws to stand, or was she going to take a stand? Even while the cops were putting her in handcuffs she didn't think this would be any different than those arrested before her. But just like with Rosa, perhaps the time had come for many to make their voices heard. The next few hours were a blur for Rosa. E. D. Nixon, the NAACP chapter president, quickly posted bail, putting his house up on bond, and began mobilizing those in his organization. Activists, along with pastors, met and coordinated a boycott of the Montgomery bussing system on Rosa's court date, Monday, December 5th. Pamphlets were distributed that night announcing the boycott for Monday. Ministers rallied their congregations during church services. Seventy-five percent of bus patrons were black. Nixon hoped the boycott would send a message with 90% of the black community participating. The lost revenue made a statement, but not a change. Black leaders regrouped that evening and formed the Montgomery Improvement Association (MIA), electing an unknown 26-year-old minister as their president, Martin Luther King Jr.
A simple list of demands was made: First-come, first-served seating with whites filling from the front and blacks from the back, more frequent and convenient stops in black communities, black drivers in predominantly black routes, and basic human courtesy to the black community. After requests were again dismissed, King proposed the continuation of the boycott until demands were met. Nixon's strategy was to challenge the segregation law in court. He passed on utilizing the other two young women's arrests, feeling they were not a good face for their cause. A pregnant teenage girl couldn’t be used as a moral crusader. Rosa was another story. A well-respected and liked member of the community, she was a woman both blacks and whites could unite behind. The NAACP filed a lawsuit with Parks as the plaintiff arguing the law was unconstitutional. Under the peaceful and respectful leadership of Martin Luther King, the black community held together for the boycott while the case went to court. Taxi services participated in the beginning, charging black patrons the 10-cent bus fare until the city sued them and won. The MIA organized a large carpool system while many chose to simply walk to their destinations. Blacks in Montgomery understood the evils of racism and looked it square in the face, not with hate or contempt, but with determination and peace. They could have stormed the bus stations or became abusive on the busses. They would have made the news but they would not have gained support. Instead, under King's influence, protestors choose to take the extra time to walk from place to place not for themselves, not for their own satisfaction or glory, but to obtain dignity for their children and grandchildren. Where Rosa's generation was forced to walk while whites rode busses to school, blacks now willingly volunteered to walk for freedom and liberty. During the time of the boycott many of the activist leaders were targeted. Both Nixon's and King's homes were bombed, yet neither one returned with violence. King's peaceful approach to change was making all the difference in the building of the foundation of the Civil Rights Movement. On June 5, 1956, the Montgomery federal court sided with the NAACP, ruling the segregation laws violate the 14th Amendment passed in 1868. Appealing the verdict, the city of Montgomery continued to reject the MIA's demands as the case advanced to the Supreme Court. Victory was secured on December 20, 1956, with the Supreme Court upholding the lower court's ruling. The year long boycott was over. 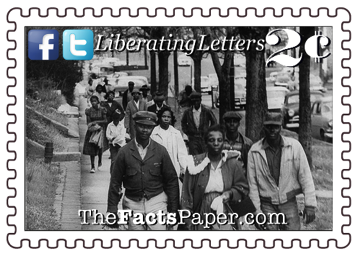 King called for an end to the Montgomery Bus Boycott the next day. Last Friday, Black Lives Matter (BLM) protesters marched in the streets of Chicago demanding justice for Laquan McDonald by disrupting Black Friday shopping. McDonald was high on PCP, brandishing a knife and suspected of breaking into cars the September 2014 night Officer Jason Van Dyke shot him. Such facts mean nothing to the BLM movement. Van Dyke's indictment last week coincidently set off protests in Chicago at Thanksgiving time just as Ferguson had done one year earlier. Friday also brought the inditement of Corey Morgan, who lured 9-year-old Tyshawn Lee into an alleyway and executed him. There were no calls for justice for Lee in the weekend protests. Morgan, along with two other gangbangers, targeted Lee, the son of a rival gang member, in a retaliatory slaughtering. Morgan and his friends riddled Lee’s body with bullets even though he raised his hands in a vain attempt to defend against the onslaught of handgun rounds. Why is Lee's death irrelevant while BLM protested the death of a thief armed with a knife? They were also eerily silent as eight Chicagoans were killed and twenty wounded during their protest weekend. Over 2700 shootings and more than 440 deaths have occurred in Chicago this year alone yet McDonald’s is the only one protested. Don’t Black Lives Matter? Apparently only if cops are involved. The actions of Nixon, Parks, and especially King prove they would not have supported the BLM movement. King famously said, “I have a dream that my four little children will one day live in a nation where they will not be judged by the color of their skin, but by the content of their character.” Does that sound consistent with BLM activists declaring that the "All Lives Matter" slogan is racist? Unlike Black Lives Matter, these amazing people, along with countless others, fought for the desegregation of busses, lunch counters, schools, water fountains, restrooms, concert seating, everything. Today's activists at Mizzou are regressing back to the times of "separate but equal". They are willingly segregating themselves because they are too afraid of being offended, demanding a "safe space" where no one can hurt their feelings. Well what if Rosa Parks had felt that way? or Nixon? or King?